Now The Wall Street Journal (May 19, 2014) reports that NFL teams are starting to see “green” as well. The San Francisco 49er’s new $1.2 billion stadium will be the first in the league to feature a “living roof,” a canopy of green and flowering plants nestled across the top of an 8-story tower of luxury suites; this will reduce the building’s energy use and offer other environmental benefits by providing natural insulation. NFL clubs are also developing green programs to reduce energy emissions. They are using solar panels, wind turbines, electric charging stations and other low-carbon alternatives. The NFL is part of a general effort among U.S. sports leagues to embrace cleaner energy, led by a group launched in 2011 calling itself the Green Sports Alliance. Alliance officials say sports teams that go green help boost public awareness of environmental goals while also benefiting their operations by lowering their energy costs. The $1.2 billion Atlanta Falcons Stadium, set to open in 2017, will include a rainwater-collection system to use for irrigation and cooling. 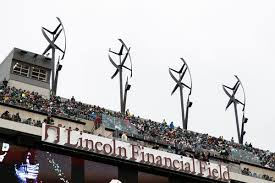 The Philadelphia Eagles’ Lincoln Financial Field has installed features including energy-saving timers and sensors for lighting and cooling equipment. These and other energy-saving features have cut the team’s power consumption by half. The Houston Texans have created an interactive media guide, saving 2.6 million pages used in printing; the Redskins have installed solar panels at FedEx Field; the Rams have printed game tickets on recycled paper; the Vikings have put in reduced-flow plumbing at the players’ clubhouse and training areas; and the 49er’s stadium is net energy neutral, which means it is expected to generate all the energy it needs for the team’s 10 home games. ← Offshoring and Reshoring Reach a Balance for U.S.